The only time you’ll need to worry about floor area ratio is if you’re buying a house in NYC. Only then will the FAR calculation even matter to home buyers. 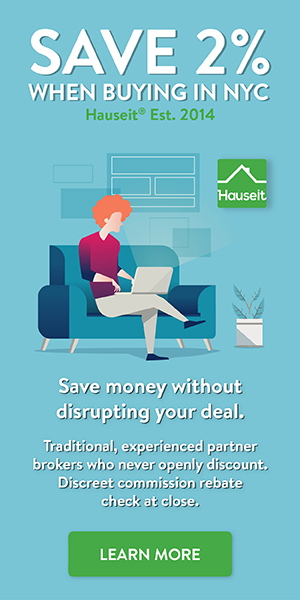 That’s because even if a co op or condo building has under-utilized its floor area ratio, you won’t have much say as an individual owner or shareholder on what the building does. Furthermore, the only time most NYC home buyers will even think about floor area ratio is if the house they are considering buying advertises that it has excess floor area ratio to build extra floors or frontage. Only then will most home purchasers even consider doing a FAR calculation. That’s because most home buyers are not developers and aren’t buying a property with the idea of maximizing FAR and flipping it. 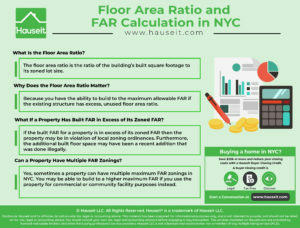 What Is the Floor Area Ratio? 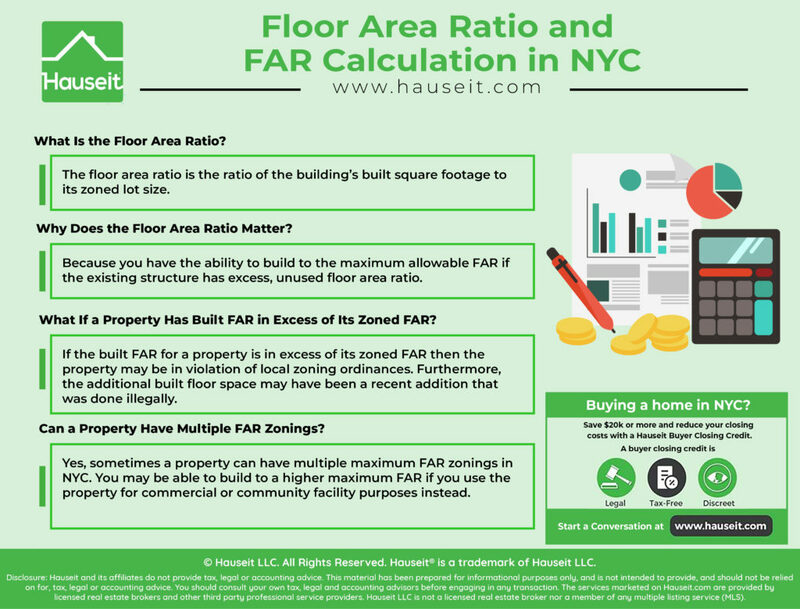 Why Does the Floor Area Ratio Matter? What If a Property Has Built FAR in Excess of Its Zoned FAR? Can a Property Have Multiple FAR Zonings? The floor area ratio is the ratio of the building’s built square footage to its zoned lot size. For example, if a building has a 10,000 square feet lot size and the building has only one floor completely covering the lot, then it has a floor area ratio of one. Using the same example, if the building is two stories tall but each floor is only 5,000 square feet. Then the floor area ratio is again only one. As you can see, floor area ratio is an interesting zoning tool as it allows for creativity for how developers want to build their structures while still limiting the total amount of floor space in any given lot. Extra floor area ratio can be incredibly valuable if you are buying property in a pricey neighborhood with high average price per square foot sale prices. That’s because you have the ability to build to the maximum allowable FAR if the existing structure has excess, unused floor area ratio. If you are buying a house, brownstone or other townhouse in NYC with excess floor area ratio, this means that you could add extra stories to the building or additional frontage. If there is a lot of excess FAR, it might even make sense to tear down the existing structure and build a new building that maximizes FAR from scratch. Alternatively, you may be able to renovate the existing structure and make a profit on the renovation as well if it’s in poor condition. Therefore, you could potentially profit from both the renovation and the build-out of new space. Let’s take for example a typical multi-family property in Brooklyn that might have excess FAR. This property is 100% residential and has 4 legal residential units. The lot dimensions are 20.17 ft by 100 ft which means a lot size of 2,017 square feet. The building currently has 3,200 sq ft of built floor space. A floor area ratio calculation is easy, you simply divide 3,200 by 2,017 to get a current or built floor area ratio (FAR) of 1.59. The Zoned FAR for this property is 2.43. That means there is excess, buildable square footage in this lot! To calculate the maximum buildable square footage, you simply multiply 2.43 by the lot size of 2,017 sq ft to get 4,901 sq ft.
A maximum buildable square footage of 4,901 sq ft is much more than the current built square footage of 3,200. In fact, there is 1,701 sq ft of remaining buildable square feet on this lot. This property was listed in late 2017 for approximately $1,000 PPSF and is described as fully renovated and turnkey. As a result, you don’t need to calculate what you could make by renovating the existing space and flipping it higher. Let’s assume that it costs you $400 PPSF to build the new square footage up to the same specs as the existing structure. That means the buildout will cost $680,400. Even though there can be a premium for larger structures, let’s assume for the sake of simplicity that the resale valuation is still $1,000 PPSF. As a result, your sale price will be $4,901,000. Even if you had purchased it at $3,200,000 and spent $680,400 your cost basis would still be $3,880,400 and you would turn a hefty profit of $1,020,600. Of course, this assumes you have no closing costs and NYC real estate taxes which can be quite cumbersome. However, it’s still an interesting scenario for would be house flippers to consider! Note: You can find the zoning for your property on the NYC Planning website ZoLa. As you can see, the specifications for R6 for which 482 Warren Street is zoned are quite complex. Please consult a licensed architect if you are contemplating purchasing a property for the excess floor area ratio. You should also consult a licensed general contractor to get an estimate of renovation or new construction costs. If the built FAR for a property is in excess of its zoned FAR then the property may be in violation of local zoning ordinances. Furthermore, the additional built floor space may have been a recent addition that was done illegally. If you notice this in a prospective free standing property you are considering buying, then you must have your lawyer do thorough due diligence on this potential violation. Otherwise, a future owner may be stuck with having to fix the violation through removing the additional floor space or structure. That would be a significant unexpected expense for any property owner to have to deal with. We also recommend getting a home inspection report for any purchases of free standing properties such as townhouses, multi-family properties or detached houses. Yes, sometimes a property can have multiple maximum FAR zonings in NYC. You may be able to build to a higher maximum FAR if you use the property for commercial or community facility purposes instead. It is common to see multi-family properties in Brooklyn like the one described in our example above being zoned for both residential and community facilities (although not commercial). However, it will often have the same maximum FAR for a community facility as for residential purposes. In this example, the best use of the extra FAR would appear to be for residential purposes, especially since it is already configured as a residential 4 family property.